WPfy.me has two sister blogs, ThemingWP and HostingCaddie. These three blogs reside under the umbrella of wilwebs.org. A widget that I include on all three blogs is the Recent Posts widget. Over at the site of wilwebs.org, I am not publishing anything yet. 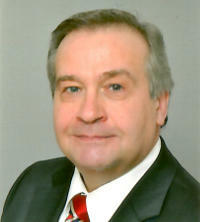 The site merely acts as a hub for the three blogs. Because wilwebs.org has not published yet, a recent post widget is pretty useless over there. In order to make wilwebs.org a bit more interesting, I started thinking about displaying links to posts on WPfy.me, ThemingWP, and HostingCaddie. And of course, without the need to create and update such lists manually. It should be entirely automated process. Set it up once, and forget about it. In this post, I start with a brief introduction of these plugins, followed by a summary of their key benefits. 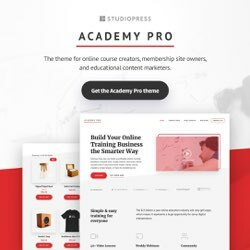 Since this post already exceeds the 1,000 words, I will write a follow-up post to I inform you about the plugin of my choice, and how I deployed that plugin over at wilwebs.org. But, let us start with an examination of the features of the plugins. Another plugin pulling in the post excerpts or the full post content is FeedWordPress. Whether you receive excerpts, or the full content depends on the configuration of the source. With a WordPress website for example, with the Reading Settings the admin determines whether the full text or only a summary is shown in feeds. Adding a feed source – a syndicated site in FeedWordPress lingo – is as simple as pasting a feed URL in the New Source field. Importing multiple sources in one hit is possible by importing a list in OPML format. Feeds & Updates allows you to enter an interval in minutes between polling. For an update schedule once a day, you enter 1440. At the Posts & Links page you have the ability to assign a status to imported feed items. Your options are publish immediately, hold for review and mark as pending, save as drafts, make them private. You can either keep included permalinks as they are, or have these pointed to the importing site. A very interesting page is Categories & Tags, where you decide how to treat the categories, tags, and formats of imported feed items. FeedWordPress is able to auto-create any missing categories, tags and formats. You can also assign a category to all imported posts, so that you are able to distinguish these from any content that you have created yourself. 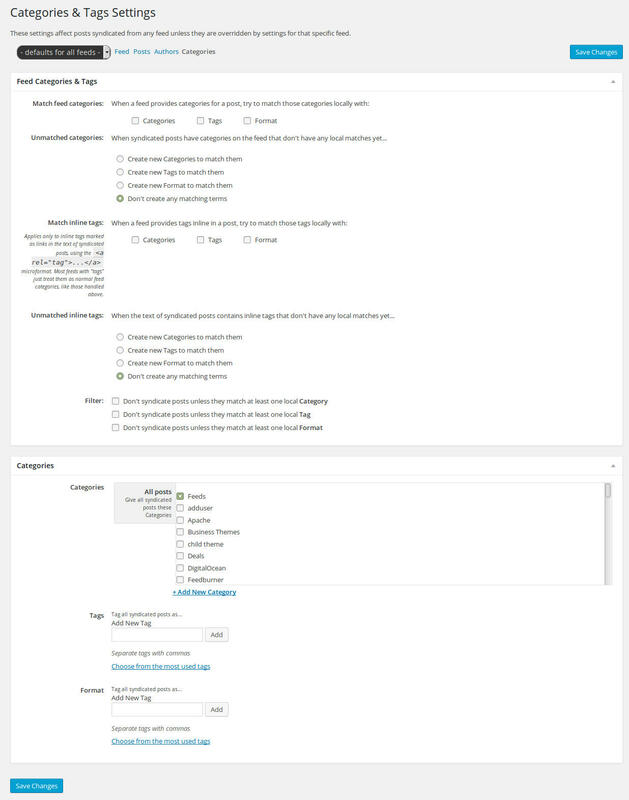 You can further extend the filtering options by installing the FeedWordPress Advanced Filters plugin. FeedWordPress concentrates on importing content and have it published. It offers a number of tools to tweak imports, like for example regarding categories and tags, but is does not provide shortcodes or templates to list feed items. More details are available in the FeedWordPress Wiki. 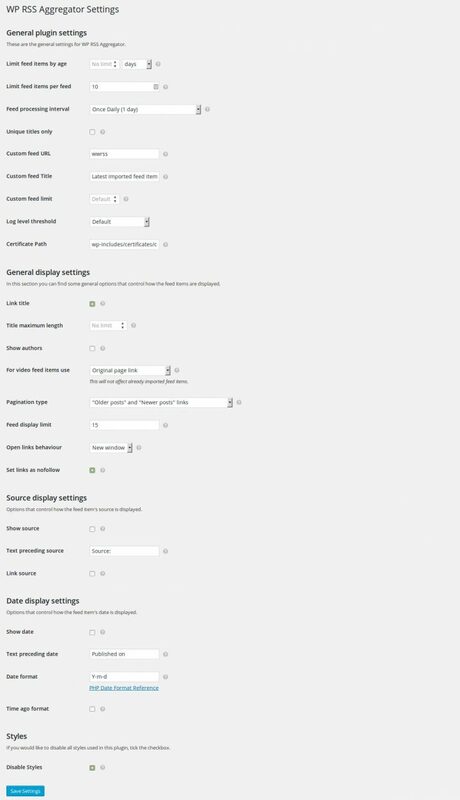 This free plugin adds a HungryFEED Settings page to the WordPress Settings panel. The HungryFEED plugin stores imported feed items in a local cache. The settings page allows you to set the refresh rate of that cache in seconds. For a daily refresh, you would enter 86400. If you also want to display feeds items with widgets, then you can enable on the settings page. This why it is possible, for example, to paste a shortcode in a text widget and have it display feed excerpts or lists with just the titles of feed items. The Custom CSS Code area shows the available CSS selectors of the plugin. By addressing these selectors, you can customize the styling of imported feeds. HunryFEED comes with three custom templates. For every feed, you can refer to one of these three templates by including template=”t” in the shortcode. Just replace the ‘t’ with 1, 2 or 3. When you prefer to include items from more than one feed in one post or on one page, then you have to put the shortcode of these feeds inline, or stack them by putting them on separate lines. The result is the same. The feeds are listed in the same order as that you pasted the shortcodes. HungryFEED is easy to configure, and yet it offers probably sufficient options to customize where and how the feeds are displayed. The result is a list just like those produced by recent posts widgets. You can create a shortcode manually, or with the aid of a dialogue window as shown above. Fore more details, please refer to the plugin’s homepage on wordpress.org, or the documentation. RSS Post Importer is a freemium plugin. You can download it for free from the plugin directory, but to enable all options, you need to purchase a Full Text RSS Key, starting at $15 a month. Activating the premium options allows you to import multiple categories and authors (compared to only one with the free option), as well as multiple tags (none with the free version). You can explore the premium options during a 14 days free trial, but you need to sign-up first. At the top of the page, you enter the details for each of your feeds. The Stats at the bottom display line, pie and bar charts regarding those feeds. The general options in the middle, affect all feeds. Here you select the refresh rate for the feeds, and assemble the template to display the feed items. In the image above, you see a green button at the left. That is part of a chat client included with the plugin. 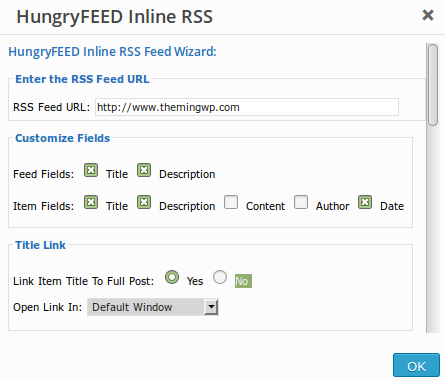 RSS Post Importer offers several options for selecting feed items. Think of Post Status (Published, Draft, etc), and author, which you can select from a drop-down window. RSS Post Importer does exactly was the name says; it imports feed items and adds these to your database as regular WordPress posts, which you can include in your own blog feed. You can either opt for importing the full post content, or just the excerpts. WP RSS Aggregator is another freemium product. You can install the plugin for free from the Plugin Directory. For additional features, you have to purchase extensions. Feed imports and the presentation of feed items are managed from the settings page. You can, for example, have the titles of feed items link to the original posts. Or whether you want to show or hide the source and/or publication date. When you prefer the styling of your theme above the default styling of the WP RSS Aggregator plugin, then you can disable the stylesheet of the plugin with a click. For more details about the possibilities with WP RSS Aggregator, please check the plugin’s documentation. FeedWordPress and WP RSS Aggregator impress me the most. The features are well organized and pretty self-explanatory. RSS Post Importer tries to cover too much ground on one page. They should move the feed management to another page – and the stats probably too. HungryFEED also packs all settings on one page, but is able to keep it clean. 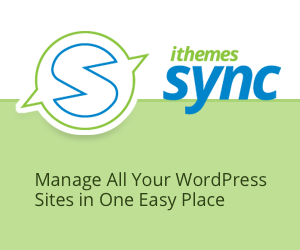 Among others, because there is no need for this plugin to manage feed sources. You simply paste them into the shortcode. Which one is the best? It all depends what you want. 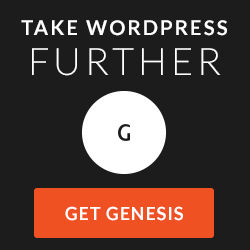 When you need to republish excerpts or the full post content of imports, then you have two free options – FeedWordPress and RSS Post Importer. Both plugins actually import (the content or excerpts) of feed items and stores these in the WordPress database. HungryFEED does not add feed items to the database, but stores imports in a local cache. You can either display excerpts or lists with HungryFEED. WP RSS Aggregator only displays lists, unless you opt for extensions like Feed to Posts, or Excerpts & Thumbnails. The most important question to ask yourself is what you want to display? Full posts, post excerpts or lists with just the titles. Last but not least, it is of course great that it is so easy to import content from elsewhere, and publish it on your own website. But as you will understand, it is not always permitted to do that. Please consider the rights of the potential source, prior to importing and publishing content from others. Within a few days, I will publish a follow up on this post. In that post I will unveil the plugin of my choice and how I implemented that plugin over at wilwebs.org.